On the night before Johann and I did this ride we had camped in the Chief's parking lot beside the highway. Our plan was simple. 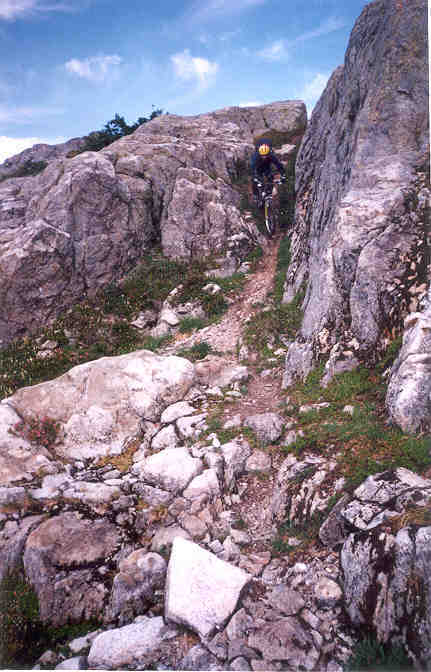 We would save the $150 helicopter ride to the top of Goat Ridge by strapping our bikes to our backs and walking up. We didn't know if there was still a trail up to Goat Ridge but we knew there once was one via Petgill Lake. Also we didn't know where the somewhat famous Disneyland Trail came down. Only that it started on Goat Ridge and ended in Britannia. We walked to Petgill Lake without incident and stripped down for a dip. Then sniffed around a bit for the trail that was supposed to continue on. We found a flagged route off to the right (south side) of the lake and followed it up. The trail was non-existent at times and is really steep also. There is one section that has a fixed rope to ease progress. After about five hours from the Murrin parking lot we started topping out and into smaller trees and tarn country. There the trail started to become more prominent. We knew that at six hours we would have to turn back and, if we couldn't find Disneyland, we would just have to walk back down the hellish route we took up. We started walking faster so as to avoid this. At six hours with no sign of Disneyland I stopped to contemplate our situation. Johann just then noticed an "H" made out of stones that we took for a helicopter landing site! I was elated. This is at 5100ft. We still didn't know where we were going but things were looking up. We rode back down our route, keeping an eye wide open for a trail on our left. This section of the ridge is alpine rock, snow and some sections of trail. Really technical riding some of which I didn't walk. I told Johann to be extra cautious because I knew that he likes to ride just beyond his limits. I figured that this was not the ride to have someone get hurt on. Minutes later I watched as he bounced out of control down a really steep section and almost held it together. He took a good spill but only enough to make him sore for the following week but not enough to slow him down for this ride. Just as we got close to the end of the alpine/tarn portion of the ridge we found what we were looking for. There was some sort of ATV sign a short way down to give us further encouragement. We rode some of the best trail I have ever been on. Really steep sometimes flowing single track with absolutely no built up sections. All natural. So steep that when I couldn't hold on anymore I would fall off the back of my bike and continue to slide at speed for a short while. We got lost for a short time because we had to ascend for a section and that made us nervous. The trail just never seemed to end. The valley bottom when it could be seen was not getting closer. We spent four hours all told descending. A fair return on our investment for sure. We got spit out on a road that took us into Britannia and I hitched back to the car. In late September 2003, Matt Smith joined Johann and myself and did the same ride in the same manner. It took an extra hour to get to the top but for the most part everything was just as fine as the first year. We had parked in Britannia and biked up to the start. Johann reported that he suffered a week of giardia in Europe after our last trip as we drank some tarn water due to me being too stupid to bring water. I had just brought an empty 750ml water bottle. Update 2004 : Self-Propelled Finally! On August 14th 2004, (seven days after my wedding to Nola) Johann, Matt and myself met in Britannia to do the trip once again. Johann had sworn to never suffer the approach again but after 11 months he seemed to have forgotten this. Matt arrived nine minutes late and apologized. Then he asked me what time it was. I told him he was only nine minutes late and he was astounded. He hadn't checked his watch since 3pm the day before. 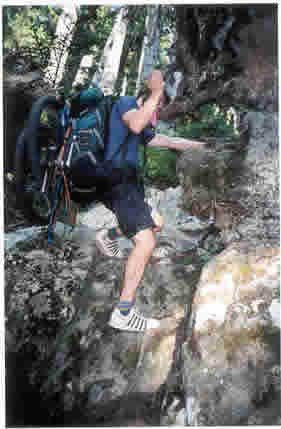 Matt had agreed to "lead" this trip for the Self-Propelled Outdoor Club the year before. Unfortunately he had moved to Roberts Creek since. The club rules clearly prohibit the use of ferries and so Matt was obliged to kayak from Port Melon after biking it there from home. He had camped on the north side of Gambier Island the night before. Johann and I met in the downtown east side at 5:15am and biked to meet Matt. As we waited we watched a helicopter fly off with eight bikes hanging below. We still don't know where it was headed but we took a picture of it and had a laugh. It took nine hours from the start of the trail this year as we were a little bit tired and we had some bivy gear and booze on board. We drank a small amount of scotch at the top and past out fairly early. Since Nola had had a Stagette but I hadn't had a Stag we declared this my Stag party. It lasted about 20 minutes and consisted of Johann shaking uncontrollably while smoking and joint and drinking scotch. Matt and I stayed up only five extra minutes and shamed our families by not finishing the scotch. We woke up and fixed this by polishing off the extra. Then we set off to ride the trail. All was well until we did the traverse uphill and it got very bright very fast. There is now a logging road cutting through right here. We found the trail up hill 50 or 100m up the road from here. A small amount of riding brought us to the same road but lower down. The trail picked up directly below. Some of the trail down lower (old logging road with deep water bars) was really overgrown. Then the really great riding section followed. Smooth flowing fast single track with a steep angle. After this you push up hill and back into more cut trees to try to walk over and through. Then it's just a matter of finding a way out by way of a logging road. So the quality of the lower trail is being jeopardized by logging in the area. Johann has sworn off this trip forever!! We'll see.